They are odd things, those hairy little arcs sitting above our eyes. Be they bushy, bristly or barely there, many of us don’t realise what a huge aesthetic influence eyebrows actually have. Our eyebrows are essentially one of our most important facial features, a well-manicured brow can balance out strong facial features such as noses and lips, soften a strong jaw or frame a rounder face not to mention create an optical illusion as gravity begins to set in. Over the years we’ve been encouraged to pluck, tweeze, pencil, primp, tattoo and even transplant them, creating a multi-million dollar industry and bunch of frustrated and confused women in the process. We’re forever pouring over the pages of fashion mags and the celebrity faces that fill them, searching for inspiration and direction from their latest looks. If we were to heed the haute couture trail blazing of Givenchy, Alexander Wang and Marc Jacobs as winter gets into full swing, it would be bye-bye to Bambi brows and the divine Ms Delevingne is done! 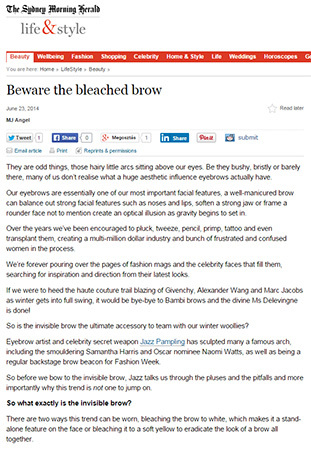 So is the invisible brow the ultimate accessory to team with our winter woollies? 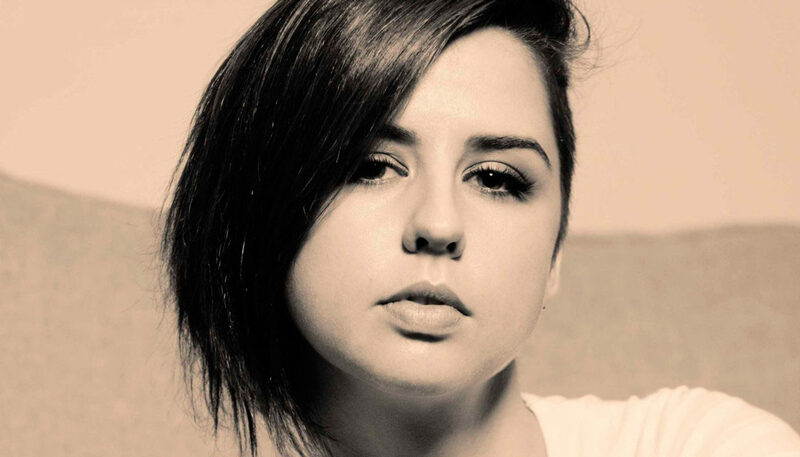 Eyebrow artist and celebrity secret weapon Jazz Pampling has sculpted many a famous arch, including the smouldering Samantha Harris and Oscar nominee Naomi Watts, as well as being a regular backstage brow beacon for Fashion Week. So before we bow to the invisible brow, Jazz talks us through the pluses and the pitfalls and more importantly why this trend is not one to jump on. So what exactly is the invisible brow? There are two ways this trend can be worn, bleaching the brow to white, which makes it a stand-alone feature on the face or bleaching it to a soft yellow to eradicate the look of a brow all together. “While you can use facial bleach, brow hair is stronger and coarser than other facial hair, which means if you decide to do a DIY job, you could end up with brassy or orange brows and the darker the brow hair the more difficult to bleach,” says Pampling. What the fashion mags or celebs pimping this look don’t tell us is the long-term effects associated with this eye-popping trend. If Katy Perry, Miley Cyrus and Kendall Jenner are doing it, why can’t I? “We sometimes forget that these looks are created by make-up artists to add a thrill or other-worldly element to a fashion shoot, video clip or catwalk. These looks are never intended to transcend into our daily lives,” explains Pampling. “A safer option is to apply some concealer to the brow using a mascara wand and brush the concealer through the brow to create the barely there look,” says Pampling. “Dampen a cake of soap with water and skim a fine paste using a mascara wand, be sure to work gently as you push the eyebrow hair upwards so it lays flat,” explains Pampling. Once the soap has dried, softly apply some concealer or foundation over the top to block out the brow and the best bit it washes out leaving no long-term damage. Pampling believes the perfect brow isn’t what’s cavorting down the catwalk or splashed on magazine covers and urges women not to follow trends for trend sake, but rather work with what makes you look your best. “Not all of us can or should have an on-trend brow. The perfect brow is all about working with your natural brow shape and simply creating a more groomed version of that,” she says.